To put it bluntly, skeleton racing is terrifying. Even it's name is a little scary. Humans hurling themselves headfirst down an icy hill on a hunk of metal with no brakes, hitting speeds of 80mph? It's a recipe for disaster. Then again, it's also one of the most fun Winter Olympics sports to watch. Unlike skiing or snowboarding or figure skating, skeleton -- like curling -- is a bit of a mystery for most folks. So, to clear up any confusion over what it is, how it works, or when to watch, we've put together a primer on all things skeleton, so you can thoroughly impress your pals as you're catching the action taking place at the PyeongChang Games. So what is skeleton racing, and how is it different from luge? 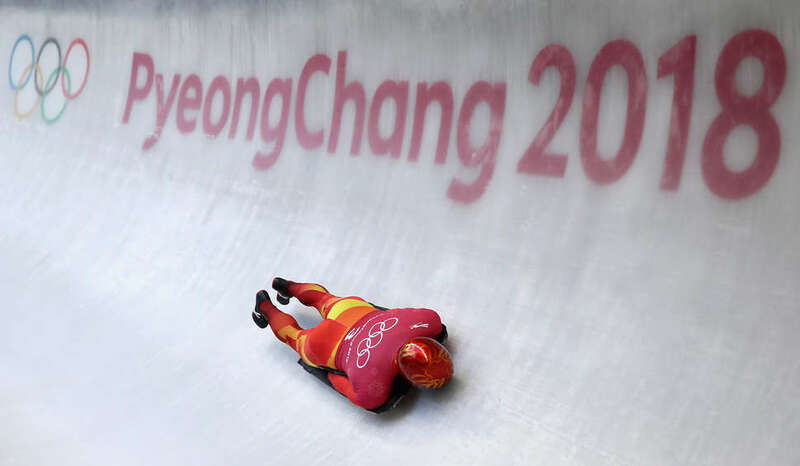 Much like luge and bobsledding, skeleton is done on a sled on a downhill ice track, but there's one distinct and dangerous difference: racers go down headfirst. Also, unlike bobsleds or luge sleds, skeleton sleds have no brakes or steering mechanisms, meaning the rider (a.k.a. the "slider") must steer and control things using only their body. Similar to bobsledding, sliders get a running start (roughly 30 meters) trying to pick up as much speed as possible before jumping on their sleds. The sport was born in St. Moritz, Switzerland back in the late 1800s as a spinoff of the British sledding sport known as Cresta, and while the origin of its name is a bit uncertain, many believe it's a nod to the fact that the ultra-thin sled's vaguely resembles a human skeleton. The first ever skeleton track, known as the "Cresta Run," was built in St. Moritz in 1884, and when the Winter Olympics were held in the Swiss city in 1928, it was the first time a skeleton program was included in the Games. Skeleton appeared once more in the Olympics when they were in St. Moritz again in 1948, but didn't become a permanent Winter Games event until 2002 at Salt Lake City. How does skeleton scoring work? For all the dramatics involved, the objective of skeleton is actually quite simple: be the fastest. Sliders complete four runs over two days, and whoever has the fastest cumulative time at the end, wins. Often, races are decided by hundredths of a second, so it's really all about eliminating as much drag as possible. How does skeleton steering work? Steering or braking mechanisms are absolutely prohibited on sleds, which are made of metal and can can weigh up to 95lbs, so sliders move their bodies ever so slightly to strategically navigate the course. The sleds are often customized to fit the sliders' frames, but beyond that, it's all about keeping the body as aerodynamic as possible, shifting weight in the knees and shoulders (and occasionally using the feet to push into turns). However, the objective is generally to stay in control while steering as little as possible, since you don't want to chance slowing down even a little bit. Skeleton runs typically finish in under a minute, but the whole ride is actually quite grueling on the body, so it can be tough for sliders to endure more than a couple runs a day. Considering sliders are sprinting for 30 yards, crouched, while pushing a super-heavy sled, then bouncing around like a rag doll, it's not difficult to understand why. Also, taking a tight turn at top speed can produce the effect of 5 G-forces on the body (for perspective, astronauts only experience 3 Gs during liftoff). As Matt Antoine, a member of this year's US Olympic skeleton team, described to The New York Times, "We compare it to a contact sport." In a word: incredibly. Sliders do wear helmets and occasionally elbow and shoulder pads under their bodysuits, but considering their chins are mere inches off the ice as they're barreling down the course at up to 80mph, even a minor slip-up can be catastrophic (beware Googling "skeleton race crashes"). However, most insiders consider luge to be the more dangerous sport, because luge sleds can go faster and can be controlled, leaving more room for rider error. Team USA actually has the most Olympic medals in skeleton of any country competing, with eight in total, including three gold. This year, Americans Matt Antoine, Katie Uhlaender, and John Daly are the ones to watch out for, and all have a good chance of medaling. In terms of their competition, keep an eye out on the German women, as well as South Korea's own Yun Sung-bin. All the skeleton action at PyeongChang goes down this week, with the first being the men's first and second runs on February 14 at 8pm EST on NBC, followed by men's third and fourth runs on February 15 at 8pm EST on NBC. You can catch the women's first and second runs on February 16 at 9:30am EsT on NBCSN and the women's third and fourth runs on February 17 at 1:30pm EST on NBCSN. Of course, you can also catch all the action via the live streams here.